Here is a list of all the postings chris evans 8 has made in our forums. Click on a thread name to jump to the thread. Thread: Paul Heckles - Excellent training session! i'm sure he's great and there's no doubting that a good instructor can make all the difference but paying for it? really? wow i had no idea people did that. at my club there is a very rich vein of people who more often than not turn up without a model just to help others... i guess we are lucky. richen the LE needle a bit? Now I am in the process of constructing a model which will require 10 receiver spaces (assuming i dont Y lead) but i am not sure if my transmitter will support it. - does each 'function' i.e AILE relate to a single channel. i.e if i have 2 servo ports used does that count as just AILE channel? and to whoever said the rebuild was done to optimise for mobile... have you seen their mobile site?! A great build Pete and really good thread. Thanks for sharing. Very useful! I was on the hunt for a slightly (but not much) sportier scale-ish stable-mate for my SIG Rascal and wanted a home for a Saito 62 so this seemed like a good bet. I *think* I will achieve that but I'm a couple of weeks away from the maiden so time will tell. Mine is built as the clipped wing but like you I opted for the dual aile servos, though I kept the strips rather than modifying. Inspired by a thread elsewhere I put Eflite super cub articulated gear on it rather than the standard wire and it really looks good painted up. A perfect fit with some blind nuts and ply doubler on the fuse base. I'm not sure how effective it will actually be at softening my touches but certainly looks the part (not fully fitted here hence the skewiff struts) Paired with some Dubro 4in inflatables i think it should be fairly springy. I like your solution to the wing struts. My kit didn't seem to include (or i have misplaced) the plastic strut clips and couldnt find a replacement so my solution has been to set some 5mm dia cotter/split pin bolts into the triangular braces in the wing and on the bottom of the fuse and fashion some custom angled brackets out of 1.5 mm aluminium sheet to attach to the struts. I always think i'm nearly finished with it and then something else comes up i need to solve... but it will get there. *ALL* I need to do now is finish covering the wing. Hinge all of the surfaces. Control linkages.. electrics, fit the canopy. paint the lightning bolt. Fit the engine properly. fit the fuel tank. decals.... hack up one of my daughter's barbie dolls for a pilot... oh will it ever finish?! hello george. fellow noobie here. First time i saw a helicopter (static) in the mid 1990s i was amazed by the tech it had, i didnt even need to see it fly to know what a machine it was! nowadays i guess glow is old hat with those Trex jobs tick tocking down the strip. not my thing really but quite a sight. I remember as a boy wanting a scale JetRanger after seeing a 'bodyshell' for sale in my LHS for about 70 quid and thinking that was the price for the whole model... great hobby! Thread: Help. Bitten by bug! Long time lurker on here but time to say hello and make a confession.... I'm hooked and if i dont stop soon, not only will my garage be full and my wallet be empty, but my wife will be very upset indeed. My first hit was with my grandparents . They took me to Bobs Models in Solihull (no longer in business) and let me choose my christmas present. They probably thought maybe I'd plump for an Airfix model, maybe even a MAMOD steam engine at a push or something railway-based but we (they) got upsold a Tamiya 1/10 Mini cooper with all the necessary peripherals. i'd broken my RC cherry. Fast forward 15 years and once I was earning some proper money I started spending it on toys. Real cars for one...(fast german ones.. love taking those to bits too) , but also 1/8 scale nitro and 1/5 scale petrol things which only travel across 2 axes (boring) - but i always loved building & messing with them. I was living in London at the time and sofa-sized petrol buggies are somewhat antisocial in the local park so to keep me going I tried out some of those contra-rotating small helis in my living room; slicing through house plants and annoying my then fiancee no end. Anyway. Boring. Finally moved out to the sticks to do the children and dog thing and really on a whim decided to try model flying properly. It had always held a degree of mystery and un-attainability to me. Stuffy clubs with cliques of old boys... "it's extremely difficult" etc... hmmm. I'll give that a whirl. Whats the worst that can happen etc. Bought myself an Eflte apprentice to give it a go and fly alone in the fields behind my house. The build wasnt anything particularly special so didnt really spark an interest in that side of things, but I surprised myself at how quickly i picked the flying up - getting out of the beginner modes in a few flights and managing to fly resonably proficiently without 'assistance' after a week or so. Dog loved chasing it around and around in slow-lowbanked circles in the fields so it was mutually beneficial. Put it in the trees a few times but i was generally successful. I (Prematurely) bought myself one of those rather large Carbon Z cubs which i promised myself i would not try until i had properly mastered the apprentice. 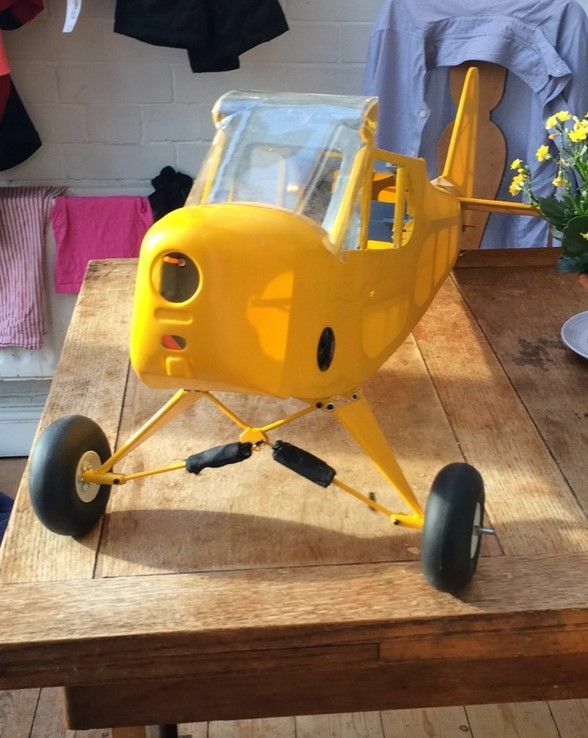 Obviously that went out the window and within about 3 days of finishing the cub and 2 weeks of having the apprentice I snuck to my local club (which I'd recce'd online) before their official hours, hopped over their fence and shot a few nervy but successful circuits in the big blue cub. Way too early for me in my flying career... but we got up, around tidily and down smoothly.... Success. I liked the facilities at the club so much (excellent rwy, wide open space etc) that i signed up a few days later and arranged a lesson with the club chairman and the club's own trainer AC.... to get myself signed off as proficient to fly there solo. Of course the problem now is that i've spent tbest part of 600 quid on a couple of foamie electrics but i've tried something with a living breathing motor; smelly, oily, noisy, tempremental... i HAD to get one. So obviously I bought myself a high wing nitro (Seagull Boomerang) which i had great fun with for a few weeks, until I lost it by doing some silly full throttle dive which i couldnt recover from (idiot... totally my fault... my first bin bag job) and from there I've moved to Hangar 9 pulse 40 which I have an Evolution 10cc in and is great fun. So far I've largely kept it out of the ground and have around 50 flights on and getting better all the time. too much too soon? probably... and a major ramble from me... but point is - what a great hobby this is! it has everything; great people, technical stuff, hand-eye stuff, being outside with like-minded people... brilliant... and what's better than sitting with flask of tea with the old boys down the club just shooting the breeze... (as long as they don't take the mick out of the new boy too much).